When it comes to your body, you should be drinking the healthiest water you can. The better the water, the healthier and fitter your body will be. Tap water may contain lead, parasitic cysts, non-pathogenic micro-organisms and unpleasant levels of chlorine - some of which can pose significant health risks to you and your family, while others make your water taste and smell bad. The truth is bottled water is typically no safer or healthier than tap water and chemicals can even leach from plastic bottles into water. water right from your tap. We have owned many water filtration systems in the past. While they all served their purpose, they all required pricey replacement filters every 1-3 months. So while we were saving on the waste (reducing the number of plastic water bottles from spring water) we were still spending the same (if not more) for filtered water as we were for bottled Spring Water. 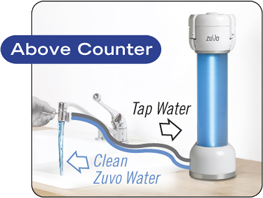 That's what excited me most about the concept of the ZUVO, the UV light works to purate your water however, without the need to purchase endless amounts of replacements filters! All you need is right in the ZUVO. Set up was super simple ( we chose to set it up above counter ), and it takes up very little space. The kid's get a kick out of the ZUVO, as it lights up and swirls as it's purating the water (the princess thinks it's some kind of show ;). The water does taste notably better, after swirling through the ZUVO. We love it in our house! For great tasting clean water without the need for endless additional purchase (i.e. replacement filters/cartridges) check out the ZUVO! What is a Hippo Roller? Hippo Roller is both a product and a charitable foundation. The product is an innovative solution aiding rural villagers with transporting potable water. The foundation is a not-for-profit (501C) organization that seeks innovative ways to fund the purchase and distribution of these rollers. Traditional methods of collecting water include carrying heavy 20 liter ~ 5 gallon buckets on the head. Over time these heavy loads place an enormous strain on the skeletal frame, causing long- term damage and premature ageing. The Hippo Water Roller is able to carry 4 times more water than a bucket with significantly less effort. It improves lives of individuals and families, saving time and energy, while improving hygiene and the health of the entire community. As a manufacturer of premium water filtration and purification devices we also have a social mission of promoting cost-affordable and sustainable access to clean water worldwide. Zuvo is donating all profits from the sale of its line of stainless steel water bottles to Hippo Roller. Leave a comment~ What other ZUVO product would you love to have? The comment is considered your entry. I entered your Total giveaway. I entered your TI-Nspire™ with Touchpad by Texas Instruments giveaway. I entered your Joovy giveaway. 1- I like Zuvo on FB. 2- I like Zuvo on FB. 3- I like Zuvo on FB. 4- I like Zuvo on FB. 5- I like Zuvo on FB. 1- I subscribe via RSS. 2- I subscribe via RSS. 3- I subscribe via RSS. 4- I subscribe via RSS. 5- I subscribe via RSS. Hello, another Zuvo product that I like is the Zuvo Beverage Faucet Kit | Bora Bora Chrome. Thanks for a great giveaway! public follower?// well duh!! Of course I am! 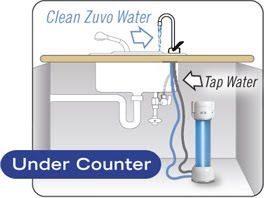 I would love to thry the Zuvo water bottle and the below counter water system.